Airtel 4G, the fastest network ever has been launched officially in India, join the network now to receive a free 4G SIM. In today’s world people want everything to be happening at a lightning speed and metaphorically we can just say that humans are running faster than light! But that’s absolutely true, we seem to want everything in a matter of few seconds. Today a pizza gets delivered at our doorstep in less than 30 minutes and humans are becoming more and more demanding with each day. It seems we have lost our patience and especially the younger generation are getting used to having things at a just a click. Same holds true with me too, being an Internet hoarder, life without internet and my Smartphone is just unimaginable. In addition I am a blogger and hence I constantly need to check the important updates that happen on this front too. Now the hitch here is I seem to be losing on essential updates and news due to my slow internet. At times the reason could be as funny as out of coverage area as I am on the move. Definitely, you can imagine how annoying it could be as you feel totally handicapped due to loss of connectivity. It is under these scenarios that I really want to stay home and get the benefit of my WiFi. Though my phone supports a 3G network, it is not meeting my needs. I am in need of a hassle free Internet and it is one of the top most priority on my list which would give me immense happiness. Yes, you can say humans are never satisfied and they always want more! Now, it seems Airtel has really answered my prayers and has launched 4G network in India. Airtel is the first telecom operator to roll out the 4G services and this is really making me so happy that I just want to go dancing in joy and celebrate this great moment. I had always craved for a lightning fast internet and hence as soon as the 4G compatible smartphone was launched in the market I had picked it up. However, till now was using a 3G network on this high tech gadget of mine, but at last my wait is over. It was in April 2012, that Bharti Airtel had launched its first 4G services in Kolkata. Earlier this month it officially announced the commercial launch of 4G services in 296 towns across India after it had successfully tested the market in some select cities. With Airtel’s 4G network which is the fastest ever I just cannot wait to experience it in my phone now. During its nationwide launch, Airtel also made an announcement that it would offer the super-fast, hassle-free 4G services at that rate of 3G, how awesome is that? Definitely need to thank Airtel for being so thoughtful, isn’t it? Thus one can opt for the 4G data packs at a starting cost of mere Rs 25. Well, not at all expensive and all the more you are able to enjoy the fastest network, does that sound amazing! Airtel has also promised its customers that for every 4G SIM swap they would get six months of unlimited music streaming and downloads on ‘Wynk Music’ along with five free movies per month for another six months on the Eros Now Channel of the ‘Wynk Movies’. Fabulous, you can now get your 4G SIM card right at your doorstep. You just need to ensure that you have a 4G compatible phone. All you need to do is request for a SIM on their specially created website for 4G/LTE and you will get your 4G SIM with a 3G data pack. 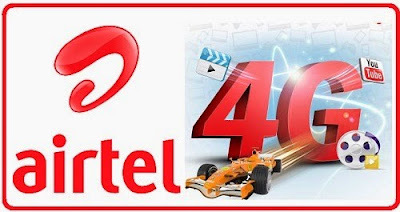 Alternatively you can also tweet on Twitter using your 4G handset using #GetAirtel4G and you will receive your Airtel 4G SIM for free of cost. Once you tweet, you get a reply from @AirtelIndia which has a link in which you need to fill your personal details such as address and in just four hours Airtel will send the 4G SIM to your place! Airtel’s latest television challenge is mindboggling. And just looking at it makes me to have it in my phone and enjoy the fastest ever network. Airtel has put up an open challenge and if anyone feels their network is faster than Airtel, it assures them it would pay their phone bills for a lifetime! Well, Bharti Airtel has launched its 4G much ahead of Reliance Industries Ltd which plans to start its 4G services in India somewhere this December. So guys what are you waiting for grab your Airtel 4G SIM now and start enjoying the superfast internet on your 4G compatible handsets!